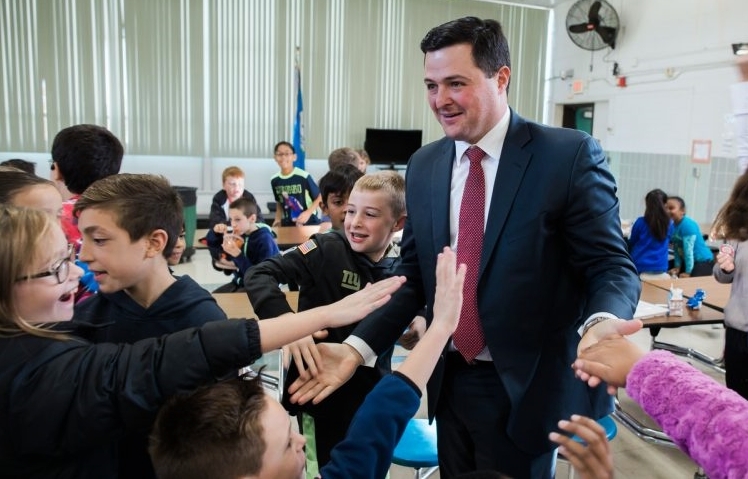 Reporter Daniela Altimari writes about Herbst, “his message is a bleak one.” Along with out-of-state publications such as Fortune Magazine, Bloomberg and others, Herbst believes Connecticut has been severely damaged by the Malloy administration. Herbst’s “amiable image, Altimari continues, “stands in sharp contrast to the politics he has practiced … critics describe him as thinned skinned, relentless, embroiled in a protracted lawsuit with his brother-in-law “… and so on, for nearly a dozen bruising paragraphs. Spare compliments, one from a former football teammate – “He really understood the core essence of a person, not just on the field, but in life” --- are noticed, after which critical comments resume. “As he pursues a high stakes run for governor,” Altimari writes, “Herbst evokes an unlikely comparison: Democratic Governor Dannel Malloy who is not seeking re-election after two terms. The two men have sharply different views on the role of government – Malloy is reliably liberal on most issues while Herbst has consistently supported a strong conservative agenda, including tax cuts for high earners, support for looser restrictions on gun ownership and a get-tough approach to crime. “But they [Herbst and Malloy] share a zealous work ethic and an appetite for confrontation. Indeed, there are telling differences. General George Patton and Erwin Rommel, who served as field marshal in the Wehrmacht of Nazi Germany during World War II, had much in common both in status and temperament. But their objectives were miles apart, and it is their differences, rather than similarities, that are decisive. Democrats, of course, believe Herbst has more in common with their presumptive target during the upcoming off-year elections, President Donald Trump. Now then, nothing in Altimari’s report is fake news. Herbst may be described as “aggressive”, though he rejects that term as unnecessarily harsh and misleading, preferring “competitive” to “aggressive.” Herbst did spend taxpayers’ money when he was First Selectman of Trumbull while defending himself from a suit brought against him by his brother-in-law, who charged that Herbst had unfairly fired him from a temporary post as Trumbull’s chief administrator because he had been dating Herbst’s sister. Herbst claimed he fired the man because he wished to avoid a conflict of interest in having his sister's boyfriend work in his administration. Herbst's mother later sued “her daughter, son-in-law and their lawyer, alleging in her suit that all three conspired to take confidential information off her iPhone,” according to a report in CTPost. All sides involved in both suits are currently working towards a settlement, according to the plaintiffs’ lawyer. Most of these important details are missing from the Courant’s recent Herbst profile. Political squabbles, particularly when lawyers are involved, do tend to be messy, but the Herbst muddle falls far short of other notorious political tangles. Even now one has only to mention President Bill Clinton and Monica Lewinsky to bring a blush to the cheeks of some morally upright Democrats. Here in Connecticut, easily outraged Democrats, in high dungeon with the corruption of former Governor John Rowland, and rightly so, winked forgivingly when Joe Ganim, reputed to be friendly with Herbst, ran for Mayor of Bridgeport soon after he had served seven years of a nine year sentence in the hoosegow for political corruption. The Bridgeport Mayor is now running for governor against millionaire Ned Lamont in a Democrat primary, and his candidacy has not yet given Democrat Party spokespersons a bout of the vapors.